In our family lore is the battle of the grilled cheese sandwich, waged between my sisters and I one summer day when I was maybe 8. The record is muddy as the accounts of the conflict disagree. Mom had preserved some of the artifacts, which now come to light and judgement. The details are still vague; I believe our mother asked us to each write a recording of the events. 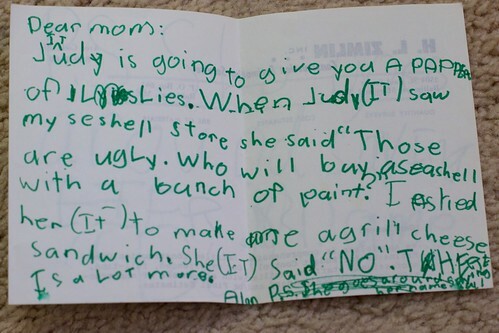 My sister’s account, typed out on a full page letter, paint a side which I still dispute. I’m writing this letter on behalf of your loving (?????) bratty son. He has’nt stoped being a brat all day. I can honestly say (and this is not a lie) that he has’nt listened to me or Harriet all day. 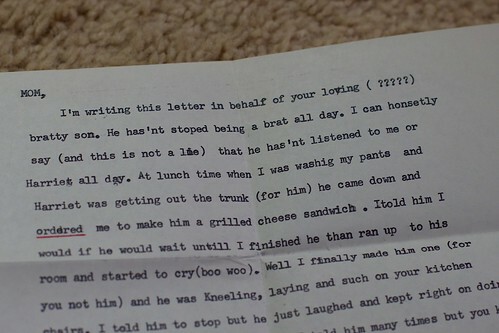 At lunch time I was washig my pants and Harriet was getting out the trunk (for him) he came down and ordered me to make him a grilled cheese sandwich. Itold him I would if he would wait untill I finished he ran up to his room and started to cry (boo woo). Well I finally made him one (for you not him) and he was Kneeling, laying and such on your kitchen chairs. I told him to stop but he just laughed and kept right on doing it. Now I detest being laughed at and I told him many times but you know him he just dose’nt listen to you, me or anybody for that matter. When Harriet and I were eating he went in and turned his T.V. all the way up (typical baby stuff) We had the radio on and he came up and turned the dial. 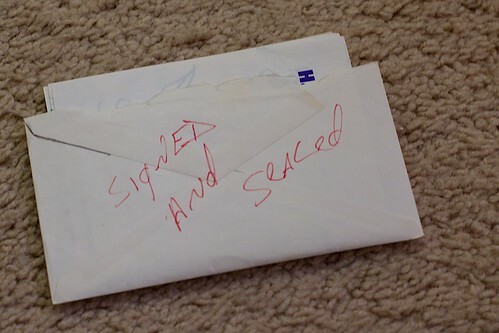 Now I8ll be honest and tell you that this is the second letter I have written, he ripped up the last one. Now a minute ago I went to the bathroom (right after him) and he made everywhere but the seat! Now I don’t like to come into a Bathroom and go wihh someone slses waste material all overthe seat! Of course I cleaned it up (for you) but If he bose’nt change his piggish ways I think daddy will have a stroke! That is a pretty damning story. 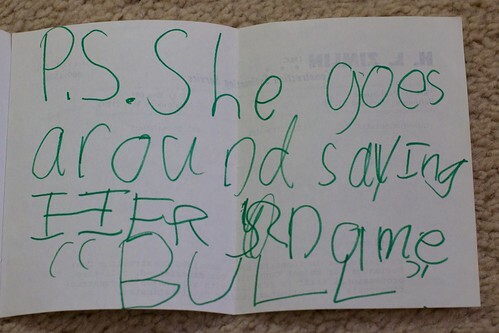 I must have been some sort of Chuckie-on-speed devil child. Evil! I asked her (IT) to make me a grill cheese sandwich. She (IT) said “NO”. During our summer trips I would collect buckets of sea shells, bring them home, paint them with colors, and try to sell them from a table in front of our house. Apprently my sister (IT) was not impressed with my early art. I think this in reference to the post grilled cheese dialogue where Judy disagreed with my assertions. Even with this archival materials, scholars debate the events of this fateful day. Maybe I should ask my internet audience to decide… what really happened? How was the grilled cheese requested? Who is the victim? Well, I can tell you I was a bratty little kid and my older sisters were charged with watching over me. I probably enjoyed pushing their buttons. I am lucky they did not bind me with tape and leave me in the woods. And that is the story of the The Infamous Grilled Cheese Incident. Maybe we will find also in the archives, details on the Dispute over Crying Over Spilled Milk Event. Family stories are rich stuff. This reminds me of the “Great Tennis Tournament” incident in my family. There still rages the debate as to who won this tournament (my brother or I), and to whom the trophy should rightfully belong. This happened some 35 years ago and, unfortunately, my mother chose the opposite route — bury all physical evidence. Regarding your story, as a younguest brother with many such memories, I would hve to say the tie probably goes to the sisters. Sorry. That is quite possibly the most adorable thing I’ve ever seen. I love the multiple perspectives. Finally, the mom in me is impressed your mother kept that for so many years!